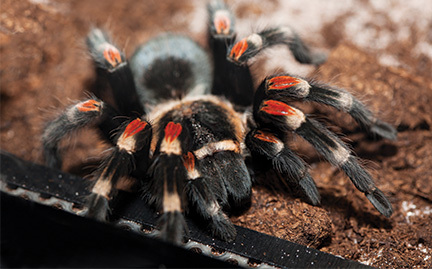 A wide variety of tarantula species are found in most of the world’s tropical, subtropical, and arid regions. Tarantulas are ground-dwelling burrowers that lay hundreds of eggs at a time. Their bodies have two segments and eight legs. Nocturnal creatures, they flip hairs from their abdomen to cause eye irritation in an attacker when threatened.